For "Sold Out" items, enter your email address and we'll let you know when it's available… typically less than 2 weeks! Add me to the store mailing list for exclusive deals! Are you looking for a discreet and convenient way to carry an extra magazine? I was and I found this concept at the 2014 SHOT SHOW. It's called the SnagMag and it carries your spare magazine as you would a folding pocket knife. In fact, from the outside it looks just like a folding knife....which is what makes this item so interesting! It's designed to "snag" on the inside of your pocket as you pull the magazine out of your pocket so you can reload fast and with confidence. It's is available for Glock magazines, of course, as well as 1911 and several others. Watch our video online! PLEASE NOTE: The firearm should be held in your strong hand, so this magazine pouch is designed to fit on the opposite side to allow for off-hand loading. The right handed version of this product is designed to be worn in the shooters left pocket, and vice versa. Please order accordingly! It's available for Glock magazines, of course, as well as 1911 and several others. Watch our video online! This is ideal for concealed carry situations as it does not draw attention to the fact that you are carrying a magazine. This universal 3-magazine holster is placed inside the concealment jackets and designed to hold and conceal any size defensive handgun magazine. The back of the Universal Magazine Holster is completely covered with the "Hook" of Hook & Loop velcro which attaches to the "Loop" that is found inside the concealment pockets of our jackets. This allows you to place the holster in any position and at any angle inside the concealment pocket. The body of the Universal 3-Magazine Holster is somewhat rigid to help support the weight of the magazines. Subscribe to our newsletter for a chance to win a $50 Gift Card! It can be hard to shop for clothing items online, especially when you are searching for concealed carry options for men and women. UnderTech UnderCover, your online source for the best clothes for concealed carry, has put together a handy chart to help you make the right choices. Before you place an order for your shirts, jackets, and more, take a tape measure and make sure you order a selection that fits you. It is important to note that you will want clothing items that fit comfortably, so keep your personal needs in mind before placing an order. Ordering quality women’s gun apparel or undercover clothing for men has never been easier. Many people trust our clothing when they are seeking items to use in a professional or personal capacity. We are confident that you will find the clothing items you need. Contact our business if you have any questions about our clothing sizes. We’ve purposely omitted the hip measurement from our sizing chart for our women’s shirts, shorts, and leggings. This is because we find that your hip measurement is not a primary factor in determining your size for our products. Our fabrics have a lot of stretch and you’ll be surprised how well they fit. Our clothing is designed to fit snuggly, but comfortably. It should fit tightly enough to support the weight of your weapon, but not so tight as to be uncomfortable. For shirts, the most important measurement in determining your correct size is your bust/chest measurement. The shirt should fit snugly around the bust/chest, so that your weapon stays firmly in place and doesn’t bounce around when you move. If you order the shirt to fit your bust/chest, the rest of the shirt will stretch to accommodate a wider mid-section, and lightly hug a smaller midsection. For shorts and leggings, the most important measurement in determining your size is your true waist measurement. The item should fit snuggly on your natural waist to properly support the weight of your weapon. Once you’ve determined your waist size, you’ll need to measure your hips at their widest point. If your hip measurement is less than 10 inches greater than your waist measurement, you would order the size that corresponds to your waist measurement. If your hip measurement is greater than 10 inches above your waist measurement, then order the next size up. For example, if you have a 30-inch waist and 39-inch hips you would wear size small. If you have a 30-inch waist and 42-inch hips, you would wear size medium. Something else to consider in choosing the correct size is how you prefer your clothing to fit. We’ve tested our clothing on a variety of people of all shapes and sizes. We find that many can wear a couple of different sizes and still be happy with the fit. If you really can’t stand wearing anything tight, then order the next size up. Your weapon may wiggle a bit when you move, but the retention strap will keep it secured in the holster. If you prefer the fit of a compression garment that really holds you in, then order a size down. If you want the garment to fit as it was designed, then order based on your measurements and our size chart. 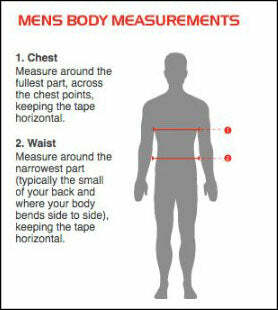 Bust/Chest - Start by placing a measuring tape around the largest part of your bust/chest. The tape should be flat but not too snug. This is the most important measurement for determining your shirt size. Waist - Your natural waist is the smallest point between your bottom ribs and hip bones. This is usually just above your belly button. To measure, relax your stomach and lie the tape measure flat around your waist, allowing for ¼ inch of slack. This is the most important measurement for determining your shorts and/or legging size.